Take a quick look on the Internet or a watch a segment on consumer alert newscasts. There are a hundreds of ways that the consumer can be scammed by carpet cleaning operations. If it sounds too good to be true – it is. Consumer troubleshooters have exposed many companies and their wily bait-and-switch and low-low price schemes. Despite all the warnings, consumer complaint sites confirm that carpet cleaning bait-and-switch scams are still the number one complaint. 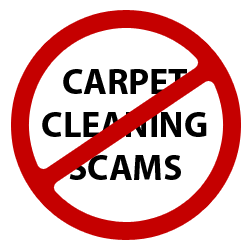 Here are a few tips to avoid the pitfalls of shady carpet cleaning companies and their tricky scams. Beware. No carpet cleaning company could possibly run a company while charging this price per room. The cost and upkeep of good equipment, the cleaning materials to do the job well, the cost of paying trained technicians – this overhead alone lets you know that it is impossible to charge so little for the job and maintain a reputable business. This type of “come-on company” is a one shot deal. They come in and do a cursory job, most of the time leaving the carpets dirtier then when they arrived. Their objective is to take the money and run. It’s a carpet cleaning hit and run. Avoid at all costs. This is a combination cheapo hit and run technique. You are called right before the holidays with a special rate (remember – nothing under $10), and they set the appointment for the day before the holiday. When they arrive they tell you for one reason or another that the special rate does not apply to your type room – or some other excuse. Because you have guests and family coming, you agree to some inflated price. Again, this begins with a special rate offer – the frequent lure. Many times these con artists hand you an unbelievable bill after the cleaning job and rationalize it by saying that for one reason or another, your particular room did not qualify for the special rate. They might also say that certain things are extra like – soap, cleaning solution, and vacuuming – things that are of course standard with reputable companies. Make certain that you are given an upfront estimate that you sign-off on before work begins – and read the fine print. Also, beware if the technician does not measure the room before giving an estimate. If he fails to take one, he’s just waiting to tell you the special price only applies to a room the size of a shoebox. If you see an ad that makes it seem as though you just won the lottery – beware. Check the websites for any cleaning company you’re considering, search for them on consumer protection sites and agencies like the BBB Better Business Bureau. If a website has no real content, beware. If you’ve hired a company and they arrive in a dilapidated vehicle with unpresentable, shoddy equipment, beware. In the end, look for reputation, references, a rock solid guarantee, Institute of Inspection, Cleaning and Restoration Certification, and insurance. Use your instincts. Have your home carpeting professionally cleaned at least once a season to enjoy your carpeting for years to come. Let High Quality Carpet bring you the quality service you deserve. To learn more about our pricing and qualifications, contact us today. We can be reached through our online form or by phone at (732) 400-5255.